Ellen over at My Conservation Baby sent us over some great stuff! 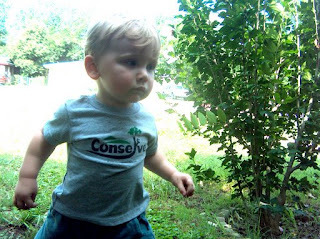 Check out Noel in his "Conserve" shirt. Doesn't he look like a little activist? These shirts remind me of the ones I was buying for myself in the 90s when it was all the rage to be a conservationist. I am sure those readers that are around my age remember this well...and now we can get our kids in on it too! MCB offers all sorts of apparel, from infants to kids, and for adults too, at their sister site, NRGawareness.org. MCB also has a list of great internet parenting resources, particularly for parents that are concerned about conserving for the next generation! They've also got a contest going throughout June-you can win $50 worth of free baby clothes for your little environmentalist! My Conservation Baby is a member of the 1% For The Planet alliance, and organization of more than 550 organizations who have committed to donating 1% of our gross sales to an environmental organization pre-approved by 1%FTP. It's considered "environmental tithing". When Hailey's back in Chicago (the little jetsetter is currently attending a wedding), you'll get to see pictures of her in her "Stop Global Warming" shirt. Beginning Monday, we'll be hosting a contest so TWO of you lucky readers can tell the world that you and your little one care about the Blue Planet too!